Happy Tuesday, bibliovores! 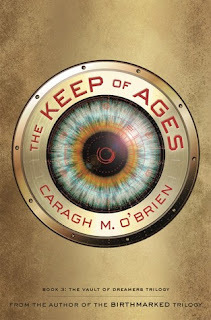 Today I have an interview with Caragh O'Brien, author of The Keep of Ages. This is the final novel in the Vault of Dreamers trilogy. Stick around for the giveaway at the bottom of this post, in which you can win a copy of The Keep of Ages! Alyssa: Hi Caragh! Welcome to The Eater of Books! I’m so happy to have you here today. I’ve been waiting for The Keep of Ages and I’m glad it’s finally here! How does it feel to complete another series? Caragh: Thanks, Alyssa! I’m happy to here on The Eater of Books! Finishing this series has been amazing for me. Rosie’s story was a huge undertaking that preoccupied me for four years, and I’m really happy with how it has turned out. When I held a finished copy in my hand for the first time this weekend, I was awed. Alyssa: Which of the three books of this series was the most difficult to write? 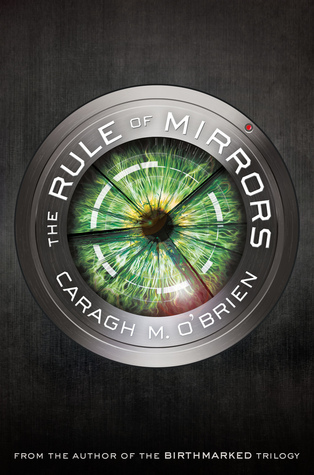 Caragh: The second novel, The Rule of Mirrors, had special challenges because Rosie’s consciousness split in two, and I was dealing with two perspectives in two characters that grew apart and intertwined intricately. It was a fascinating puzzle to work on, and it took me a long time to figure out. The third book, The Keep of Ages, had special challenges, too, but they had more to do with psychological issues than the structure of novel. The book’s a bit of a mind-bender. Alyssa: Do you have a favorite deleted/cut scene from The Keep of Ages (or any of the books in the series) that you can share or describe to us? 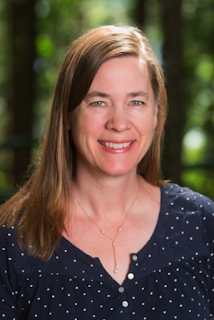 Caragh: A chapter in The Keep of Ages was originally written from the perspective of Thea, a key character in the second book, and it ended up being cut. I reworked the substance of the chapter into other parts of the novel to cover the plot turns, but I lost a scene of conversation that I liked. Writing the chapter helped me understand the characters better and identify other changes that needed to happen, but I believe the book is stronger without the little section. It interrupted the momentum of the main story line. Alyssa: Did the end of this series change, from what you originally outlined to what is now set to publish? Caragh: Yes. I had only a sketchy idea of how the series would evolve when I started it, so the entire last novel feels new to me. I originally began with characters I cared deeply about, and a creepy, intriguing situation (the dream mining), and I had to trust that the story would evolve from those elements. It did, I’m happy to report. Alyssa: Who was your favorite character to write? Caragh: Rosie has been my favorite all along. She’s so smart, but she also has a certain blindness about herself and others. For instance, at the start, she wants to be a film director and she’s very comfortable behind the camera, yet she doesn’t realize that she uses her filming of others to keep herself at a distance. Later, she grapples with truly trusting herself and loving someone. She grows enormously across the three books. Alyssa: Do you have new books that you’re working on that you can tell us a little about? Caragh: I’ve started a new project, another young adult novel, which I’m very excited about. I’ve always been interested in time and the way we create patterns and routines, so I’m playing around with that concept. I’m in a very early stage, but it’s already quite surprising and intriguing to me. Thank you for all your support of my novels, Alyssa, and for having me by! This has been a treat! "[T]here's plenty of intrigue and---as the whole dream operation is explored---a solid sense of building tension." Win a copy of The Keep of Ages! Courtesy of Media Masters Publicity. Open to USA residents only. Ends 08/18, 11:59 PM EST. You can see complete giveaway rules in the Rafflecopter or on my Giveaways page. Good luck! I love Caragh! I follow her on Twitter and I have read ALL her books! She's wonderful! "Have you read any of O'Brien's books?" I have not! I would definitely be interested to start! I am BEYOND excited to read this book! 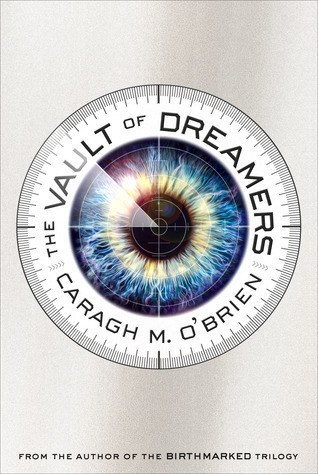 I have read all of Caragh's books and adored them all but The Vault of Dreamers series is beyond a doubt my favorite. Great covers. There is something about eyes on a cover that draw me right in. I still haven't started this series! I think it is so interesting that the ending evolved a little from her original outline. Thanks so much for sharing the interview! I haven't read her books yet, but I have a copy of the first book in this series in my personal library. I have a copy of the first book in this series ready to go. I am looking forward to reading all three of them soon. Yay for awesome interview post sweetie :D Thank you for sharing about this. <3 I don't know this author at all, ack, but she seems pretty sweet :) Hugs. I haven't read any of her books, but they sound amazing.